A barber who cut the hair and trimmed the beard of a homeless man on a Dublin street was surprised by the reaction to his good deed. Warren Flynn (22) wanted to do something to help homeless people by taking his scissors, tools and a fold-up stool onto the streets of the city. A photograph of him cutting the hair of the homeless man whom he met on Westland Row got half a million views on the Facebook page of the Inner City Helping Homeless charity. But it was the response of the homeless man himself who saw in a mirror his transformed appearance that Warren appreciated most. “I’ve been homeless for four-and-a-half years. This is the best I’ve ever felt,” the unnamed man told Warren. The young barber, who lives in Finglas South, runs ‘The Dublin Barber’ in Ringsend. For some time he has admired the volunteer work done by his friend Anthony Flynn who was one of the founders of a new charity – Inner City Helping Homeless. “I just felt I wanted to give something back as I’m lucky enough to have a job. So I went out walking the streets and I got chatting with a guy who had a sleeping bag outside Pearse Street Dart station,” Warren said. 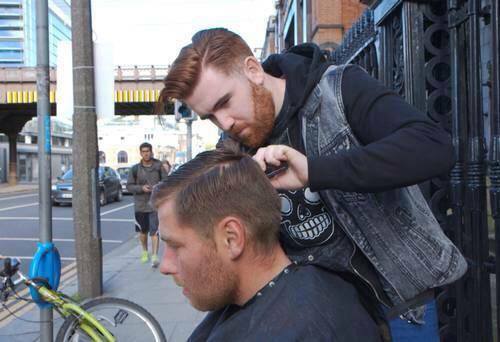 The 28-year-old homeless Dubliner accepted Warren’s offer of a free haircut. The young barber opened his fold-up stool and there, on the public footpath, the two men continued chatting as he gave him a haircut and then trimmed his beard. Warren said he plans to return to the streets in future to offer his services again to the city’s growing numbers of homeless. Being treated like a human being…..priceless. There’s still kind people in this world!! I love this! I tweeted an article awhile back about a New Yorker (I think it was?) who was doing the same thing and just feel in love knowing there are people who live a judgement free life. It doesn’t take make to show people we care about them and show them love from the heart! This is such a heart-warming post, but I can very well guess the man with long, matted hair and beard, and his delight after the transformation Warren brought upon him. I wish the haircut to become a turning point in the homeless man’s life and that he is able to settle down respectably. May God bless Warren and his loved ones!